Lodge Kohler offers views galore of that shrine of Wisconsin football, Lambeau Field. Published Sept. 5, 2018 at 9:01 a.m. Headed to Green Bay for a Packers game? Or maybe it's not game day, but you're checking out Lambeau and all it has to offer to assuage your Green and Gold fever anyway? 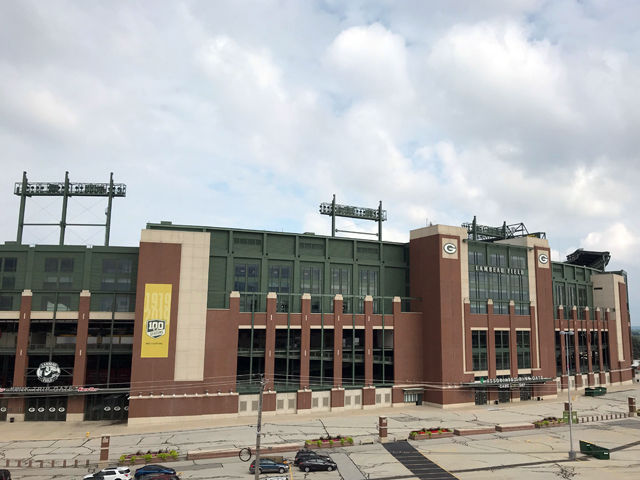 There are a few hotel options near Lambeau Field in Green Bay, but since last summer, Lodge Kohler has taken a visit to Lambeau up a notch. I'd say the 144-room, four-diamond hotel is a five-minute walk from Packers central, but you'd have to be a pretty slow walker to make the trip last that long. There is no hotel closer to the action. 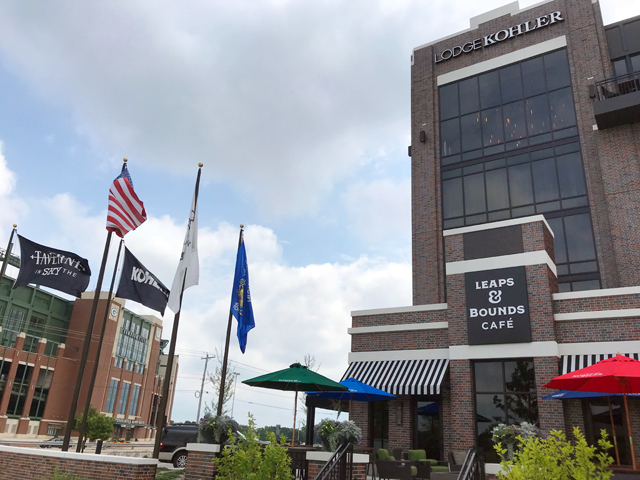 Lodge Kohler is literally steps from Lambeau, just across South Ridge Road. Need a better locator? It's next door to Kroll's West. About half the hotel's rooms look out at Lambeau, while most of the other half have a view of Titletown (see below). If you're up for a game, you can get a room, park free at the hotel and stroll right over for the action. 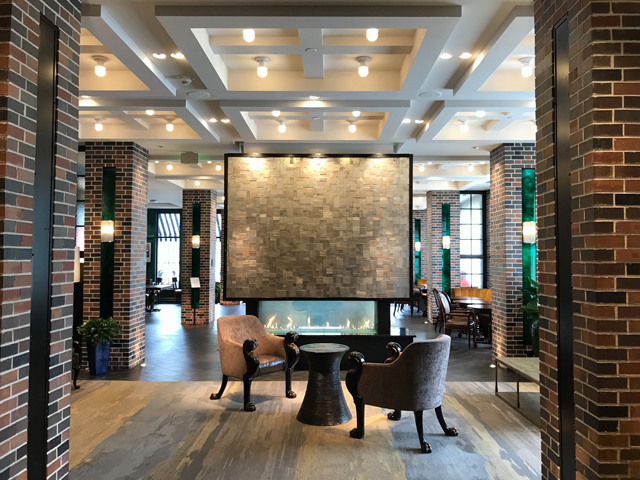 Just yesterday, Kohler announced starting next week, Bill Michaels' "LODGE KOHLER Kickoff" weekly radio show will be broadcast live from the hotel on 105.7 FM The Fan/WSSP Radio, which means the venue will become even more Packers-focused, if that's possible. 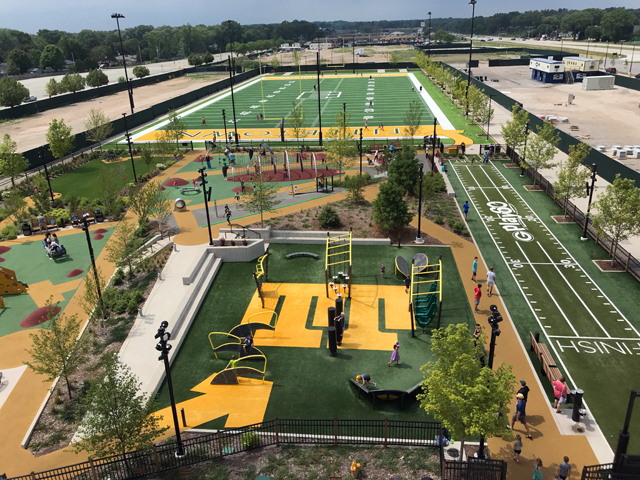 Development of Titletown, the Packers' "live block" kicked off last year when Hinterland's new brewery and taproom opened across the plaza from Lodge Kohler, which came online in July. 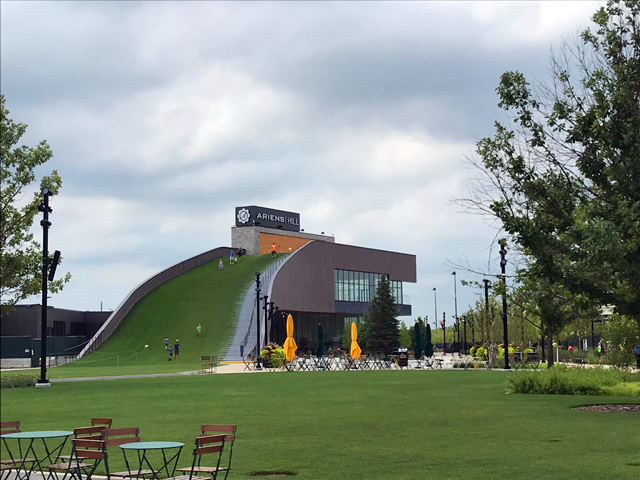 In September, Ariens Hill tubing and, in summer, rolling slope (with a bar for happy hour on top!) opened with the 46 Below cafe beneath it in Rockwood Terrace, along with a sprawling playground, an ice skating rink and course, a football field and a plaza with copious seating, landscaping, foosball tables, horseshoes and more. Currently under construction is a tech incubator building – a partnership between the Packers and Microsoft – that will have space for tech startups, as well as entertainment and food and beverage venues. A large swath of land will soon get a townhouse development. Lodge Kohler is thoroughly Packers themed, but in a modern, subtle way. It doesn't look like a hotel in a pro shop. Instead, each room – and the common areas – are adorned with monochromatic images of great moments in Packers history. And green and gold is everywhere, though, again, subtly. 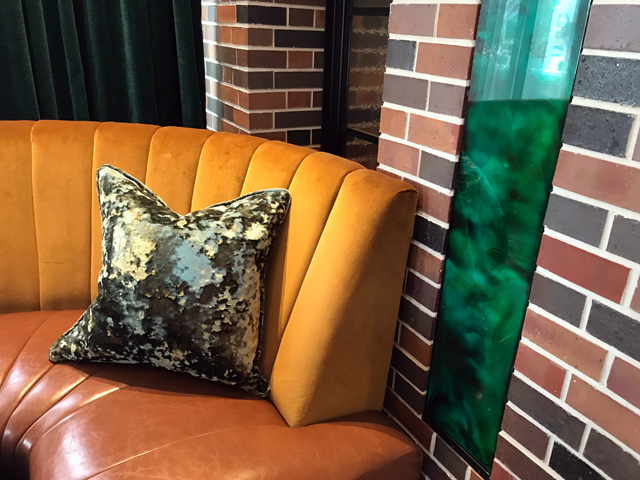 Check out the furnishings in the Leaps & Bounds Cafe off the main lobby where green curtains accent golden banquettes in a space that's meant to conjure a classic English shopfront, and glass-fronted shelves hold precious Packers memorabilia. Even the lobby fireplace has a green glow to match its golden flame. The hotel has sleek lines and a modern look. And because it's new, everything feels fresh and clean. But it's more than just the look. When General Manager Dilan Van Ryn shows me around, he points out all the USB ports throughout the public spaces: There are places to charge your phone at basically every seat near a wall in the restaurants. 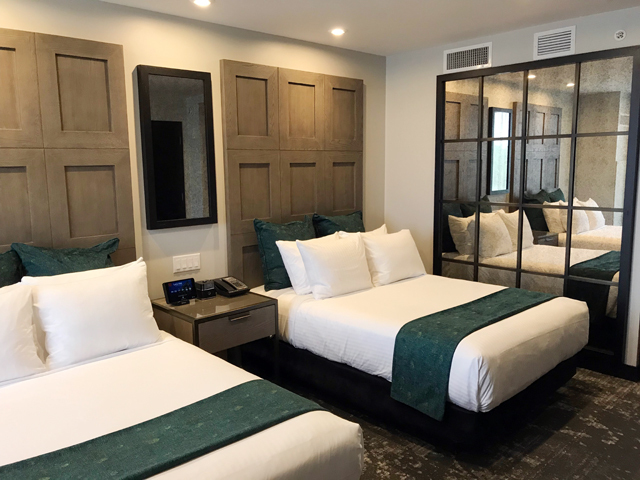 The rooms – there are 10 suites and the rest are basically the same layout, though some have double doubles and others a king – are comfortable and attractive, with all the amenities you'd expect. Because it's a Kohler property, you won't be surprised to hear that the bathrooms are stunning and thoroughly up-to-date. You'll do a double-take when you see the gorgeous turquoise tile in the showers (and not because it's a Dolphins color). OK, so this is a riff on location, but, seriously, even if you don't have a Lambeau-view room, you can have a drink on the Leaps & Bounds patio and stare at your gridiron mecca. Or you can peer at it from inside the cafe, too. Better yet, head to the top floor for Taverne in the Sky, where the food is great, and so is the amazing light fixture installation that covers the entire ceiling of the main dining room. Again, the indoor tables all have views out to Lambeau (from up here you can spy the tops of the videoboards in the stadium), but you want to be out on the terrace overlooking the stadium, where the tables are interspersed with firepits to keep you warm even if there's another ice bowl. The photo just above was taken from here. 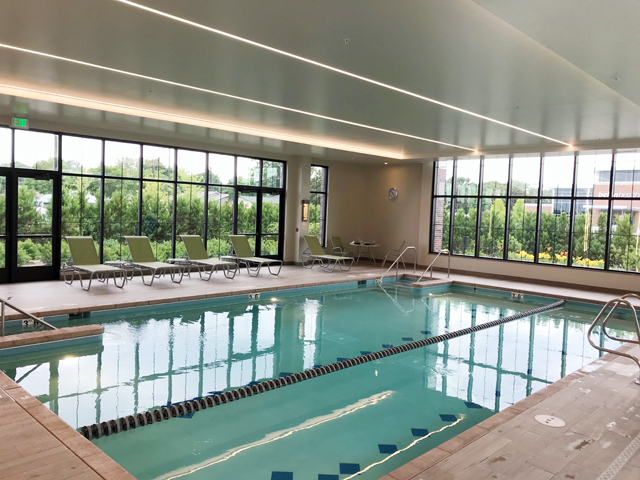 The hotel also has a family pool, a workout room, a quiet garden area and a full-service Kohler Waters Spa, because after a long day spent on the arduous task of watching football and drinking beer, you surely need to kick back and relax.